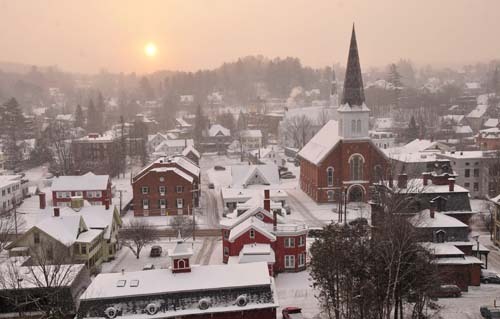 Residents of Montpelier, Vermont's state capital, take pride in the appearance and preservation of downtown and the surrounding open spaces. Montpelier has an abundance of historic homes as well as more modern options throughout the city. Hubbard Park’s wooded hillsides and miles of easy hiking trails are tucked just behind the golden dome of the capital building. Learn more about Montpelier! On a terraced site with easy access to downtown Montpelier and Hunger Mountain Coop. This home has a big covered front porch. The lot slopes back. The terraced yard above the garage has garden potential. Rare opportunity to own a solid and very-well maintained Montpelier home, and still have the upside of updating and renovating to make it just perfect. This four bedroom home has a traditional layout with a large living and dining room on the first floor, and bedrooms upstairs. The kitchen, while cozy by today's standards can easily be renovated into a spacious, eat-in kitchen with an island. You'll love being able to spread out in the huge living room, that also includes a working wood burning fireplace. Rounding out the first floor is an office (could be a fifth bedroom), a laundry room, and a mudroom. Upstairs, you'll find four bedrooms with hardwood floors. One bedroom has an en suite bathroom with a double basin vanity. Plenty of space for family and guests! Located on a sun-soaked corner lot, your new home has a two car attached garage and a covered porch. The lot is level, open, and ideal for all sorts of plants and animals. Home has been pre-inspected, and repairs and upgrades have been completed. The opportunity is yours to make your cosmetic updates, and have an attractive, comfortable home. Houses like this in the coveted Montpelier school district don't come on the market very often. This wonderful little house has been completely gutted and remodeled to its potential. All big ticket items have been replaced in the past year. New items include: Roof (2018), Windows (2018), Wiring (2018), Plumbing (2018), Propane Boiler with on-demand hot water (2018), Kitchen cabinets and Appliances (2018). It also has a front patio to hangout on summer days and has a very small yard in the back. This house is great for city life with a half mile walk to Main Street a very short walk to the College of Fine Arts and Hunger Mountain Coop. Two new cafes have also blessed this street recently. Join the growing community and take advantage of this opportunity! The finishing touches upstairs are being put together now so act fast to pick out bedroom colors! Feel like you live in the country but with all the amenities of life in the Capital City! This spacious ranch sits on almost an acre of quiet and sunny green lawn with distant views of the hills. Have your coffee out on the large and comfy screened in porch and you can see wild turkeys and other wild life or watch the kids as they play! Everything about this house says easy living--from the direct entry two car garage to the eat in kitchen and the first floor laundry. Insulation has recently been added and the pellet stove in the walk out lower level family room practically heats the whole house. The gas boiler is newer and clean and energy efficient. The walk out basement has two rooms which can be used as office space, or guest bedrooms or as a perfect in law suite with it's own entrance! Enter this beautiful elegant home through two stained glass doors. There is stained glass though out the home. There is a 1 bed 3/4 bath in-law apartment with a fireplace and a brick bar. The home has 3 beds 2 & a half baths with a heated 2 car garage, a fireplace, oil furnace with baseboard heat and crystal chandeliers. In the back there is a 32 by 32 inground pool with gorgeous landscaping. There is a large shed with plenty of parking. It is close to down town Montpelier, I-89, shopping, ski areas, bus and train transportation. 5000+- SF of commercial space available. Ground floor, handicapped accessible with updated bathrooms, new windows & boiler. Space is currently used as a restaurant and is offered for lease with all restaurant trade fixtures OR owner is willing to subdivde the space and will consider all uses. Excellent visibility, easy access to downtown.